Outstanding quality of Silvertip badger brush is considered by many to be the best material for bristles due to its ability to hold large amounts of water. 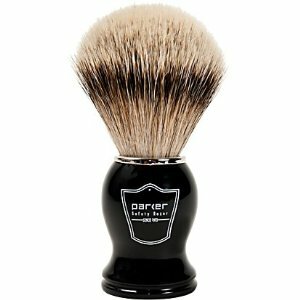 Manufactured with the highest quality bristles this brush is an outstanding companion for any wet shaver! This offering comes with a free brush stand so that you can hang the brush upside down after use — this is critical for the care of the brush to ensure proper drying and years of use! • Handmade with Genuine Silvertip Badger Bristles – the softest available! • Generates a rich luxurious lather when used with a quality shave soap or cream! • A must for preparing your face for a close shave! • Comes with a free lucite drip stand too! • A high quality brush to provide years of service!